Colleagues speak to the legacy of a pioneer in the farm-to-table movement, who was a dedicated advocate for helping low-income families access healthy, local food. The food and agriculture community lost a lion this week. August “Gus” Schumacher, Jr. was co-founder and founding board chair of Wholesome Wave, best known for its Double Value Coupon Program and Fruit & Vegetable Prescription Program. From 1997 to 2001, Schumacher served as President Clinton’s Under Secretary of Agriculture for Farm and Foreign Agricultural Services at U.S. Department of Agriculture (USDA). He also served as Administrator of USDA’s Foreign Agricultural Service, worked as a senior agri-lender for the World Bank, and as Commissioner of Food and Agriculture in Massachusetts. Schumacher was a member of the 21st National Academy of Sciences and received leadership awards for his important work. In a beautiful tribute, Wholesome Wave’s Michel Nishan wrote about working with Schumacher to bring fresh fruits and vegetables to SNAP recipients around the nation, sharing what made his work both groundbreaking and indelible. Gus was a true advocate of good food for all and a dear friend and mentor to many and will be greatly missed. We feel privileged to have known him and to share thoughts from some of his closest colleagues. Gus Schumacher was brilliant, passionate, irreverent, and most importantly human about the issues he cared about. Whether it was doubling food aid to Jordan during a difficult time there, or facilitating more nutritious food into the mouths of the poor and hungry, he was committed to the fullest extent to new ideas… Many times, he would come into my office at USDA with what at first seemed like an off-the-shelf crazy idea to impact American food or agriculture, but in nine out of 10 cases, he convinced me in his tireless, persuasive, and often humorous way that he was right. And we rarely made a mistake in carrying out those “crazy” ideas. There is an old Talmudic expression that says, “If you save one life, you save the entire world.” Gus Schumacher saved the world many times over. 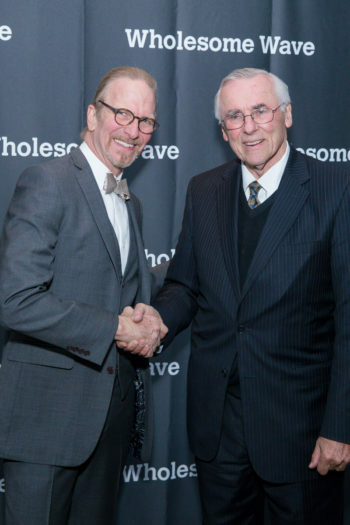 Close friends and co-founders of Wholesome Wave, Michel Nischan and Gus shook hands at the organization’s benefit dinner last April. Wholesome Wave, the good food movement, the agricultural sector, and the world at large have lost one of the most magnificent advocates and change-makers ever known. Gus leaves an immeasurable legacy: His vision and work improved the lives of untold numbers of farmers, helped spur growth in markets for farms of all sizes, and made it possible for people of all incomes to put good healthy food on their tables. The world is a far better place because of him. His impact on my own life personally and professionally has been profound. He taught me that one person can truly make meaningful change a reality for many. Gus had so many ideas that at times he could be a real handful to manage. Now I find myself wondering how we’re going to manage without him. When I first met Gus, 20 years ago, he was surrounded by farmers, academics, and a crowd of bleeding-heart liberals who wanted to blow up the food system. He looked the part of a Washington insider, and in fact, he was. He pushed legislation, dealt behind closed doors, and reached across aisles—and yet this maneuvering was done on behalf of a fledgling food movement long after he had left the beltway. Why did this D.C. insider devote his life—really, every waking moment—to a more just and healthy food system? A hint came later, in the form of an email from Gus just after President Obama won the 2008 election. He wrote about his mother, who once worked for the Harvard Law Review. She edited students—focusing opinions, streamlining arguments, and befriending them at home over the dinner table with a young Gus. Many of them went on to craft the New Deal and historic farm bills under Henry Wallace. Gus wrote about how proud she would have been to see Obama, another Harvard Law Review alum, make it all the way to the White House. But I was stuck on the image of a young Gus at the dinner table, his own arguments beginning to take shape. How lucky that he came to argue on our behalf. I had the high honor of working with, and learning from, Gus at USDA during the Clinton Administration. He was a giant who always pushed the envelope to get better programs and more social justice, across America and the globe. He was a driving force in creating the first federal program to enable seniors to obtain extra produce at farmers’ markets. He was also the spark for the Dole-McGovern program, through which the U.S. enabled developing countries to start school meals program. When the stakes were high for people in need, Gus didn’t take “no”—even repeatedly—for an answer. He kept pushing for new ways to get bureaucracies to aid people in need. Perhaps his most important legacy was pioneering ways to reduce hunger and aid community food systems and, at the same time, transcending the stale debate over whether we should focus on just one of those goals. After leaving government service, he could have taken a well-earned retirement. Instead he upped his work to make fresh, healthy food affordable and available for everyone. As a person, he will be deeply missed. But his legacy has improved the world forever. 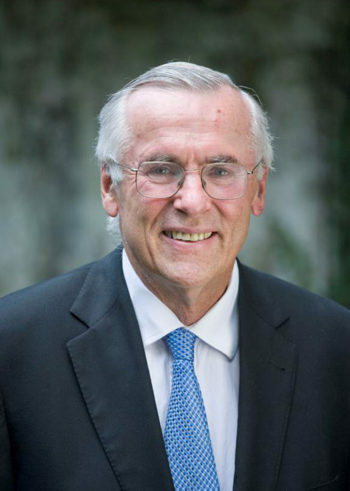 Gus Schumacher was a “one of a kind” person; visionary, thoughtful, generous, self- effacing, creative, highly intelligent, and committed to the common good for all. He was a wonderful friend and mentor to so many of us, and extraordinarily effective in seeking out public funding and policy initiatives that helped seniors, veterans, immigrants, and low-income families. All the while championing healthy eating, farmers, and farmers’ markets. He was truly a beautiful person, and many of us will sorely miss him. Gus was known for visiting Wholesome Wave partner markets almost every weekend in his hometown of D.C. 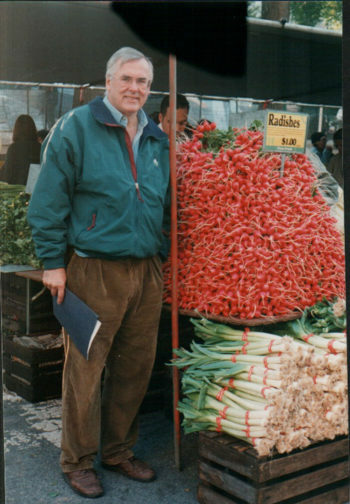 He is pictured here at one of these markets with a longtime friend and farmer. I met Gus in 2012 when I was Senior Advisor on Food Policy to Los Angeles Mayor Villaraigosa. We were planning to put together the Food Policy Task Force at the U.S. Conference of Mayors, of which Villaraigosa was president. Gus was an enthusiastic supporter of that effort, realizing the power of networks and of our urban centers to have a leading role in food system change. Over the course of several years, I was lucky enough to spend time with Gus in New York, D.C., California, and of course, Boston. (Although he lived in D.C., he was a Bostonian at heart.) He was a true mentor and the very best kind of leader to his core. He was gracious, selfless, supportive, and offered the very best kind of patient guidance as we all learned our way to some measurable level of expertise, hoping to get close to being something like the expert he was, but knowing that there was only one Gus Schumacher in the world. I am so grateful that he shone his bright light in this world as long as he did. What a world of difference he has made in our world. ~ Paula Daniels, Founder, LA Food Policy Council and co-founder, Center for Good Food Purchasing. I had many good times with Gus as we promoted the idea of nutrition incentives. We walked the halls of USDA, visited farmers’ markets and farmer communities across the nation. He inspired and cajoled. He could be crafty and, on occasion, feisty. We enjoyed many a meal and long meandering conversation. Wherever we went, people knew Gus. You could see their respect and warm feelings toward him. Among the most memorable moments I spent with him was with Hmong farmers in Fresno, California. 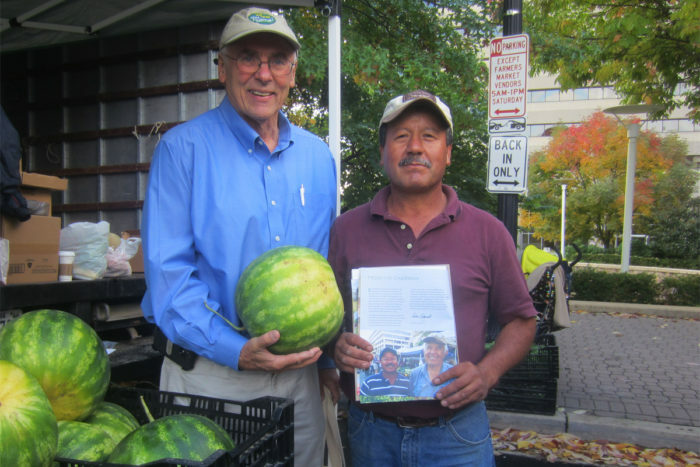 They sincerely honored him for his work to provide resources to expand their operations and join the farmers’ market world. He was deeply touched. I always felt good, motivated, and like I was part of something bigger when spending time with Gus. Gus was many things to many people, but my favorites “Gusabilities” were, first, his amazing ability to connect people from across his broad array of contacts. If you were lucky enough to know Gus your list of new friends and potential allies grew by legions. Having Gus vouch for you opened almost any door worth entering. Second, Gus was someone who could make things happen. Early in our friendship, in the closing months of the Clinton administration and Gus’s time at USDA, I met with him to see how we could continue our work at Drake creating state food policy councils. Gus told me to go see my friend in Risk Management, an agency I only knew from crop insurance. I told him I was skeptical, but Gus said they were taking a much broader view of helping farmers deal with risk and stronger local food policies is a great example. I spoke to RMA and, for 5 years, we had a cooperative agreement helping create food policy councils in 15 states, many of which continue today. People may not know it, but the hand of our great friend Gus was what made that work possible. My lesson was: Never doubt advice from Gus! Oh, how we will miss him. 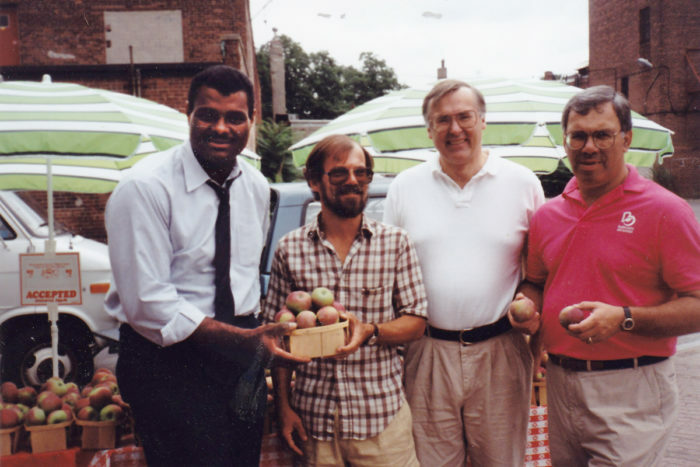 Gus Schumacher (second from right) at Boston’s Roslindale Market with former Mayor Thomas Menino (right). As agriculture commissioner of Massachusetts, Gus began his work making fresh produce more affordable for low-income Americans. I first met Gus in 2001 when Bob Lewis brought him to the Red Hook farmers’ market in Brooklyn to show how we were using one EBT terminal for an entire market. With Gus’s blessing we were allowed to be part of the pilot to accept wireless transactions at markets. Gus and I developed a wonderful friendship, talking about his family, his farming roots here in New York City, and about ways to get more money to farmers and healthy food equitably to all consumers. Dozens of farmers’ markets throughout New York City wouldn’t exist today but for Gus’s vision in creating the Farmers’ Market Nutrition Program; farms throughout our region depend on those markets for survival as do many customers who shop there. Gus’s mind and passion for this work is irreplaceable. I met Gus in 2011 when I was working at the New York City Mayor’s Office and he was helping to create linkages between people working on food policy at the local government level. I’m so grateful that I got to work with him. 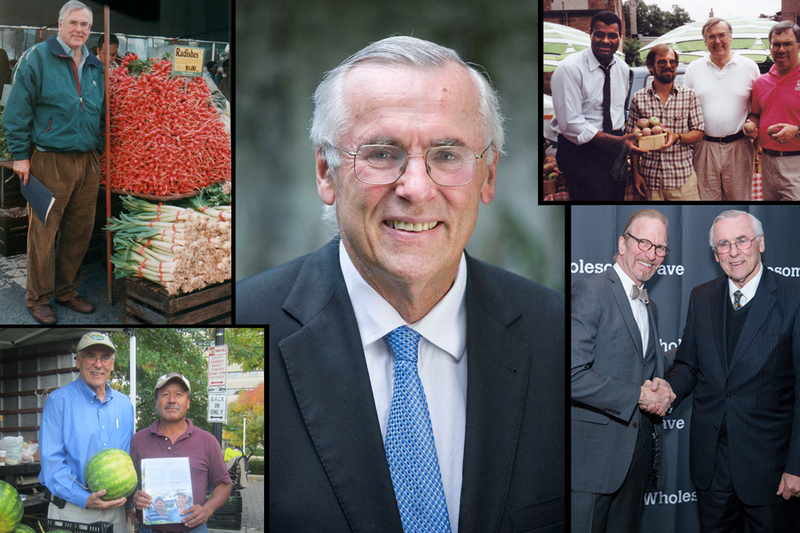 Gus was a passionate advocate and leader—a master strategist whose work helped to increased access to fresh fruits and vegetables for millions. And he was also an incredible convener, creating networks that amplified good food efforts happening across the country. Gus knew that together we were more than the sum of our parts. He was kind, generous with his time and his friendship, and he brought a sense of fun and adventure to his projects. There’s no doubt that Gus’s expertise made him a uniquely effective change-maker, but I think it was also the delight and enthusiasm he shared for people, projects, produce, and policy that made his reach and impact so significant. If those who knew him and were inspired by him can carry forward even just some of that spirit, optimism, and determination, we can continue to make the world a better place—as Gus did. When I first met Gus, I could see his passion was infectious. He brought that passion, with fresh and bold ideas, to Congress, which led to my working with Senator Kerry in 1988 to create the WIC Farmers’ Market Coupon Demonstration Project. We secured $2 million in the Agriculture Appropriations bill that year to start the Demonstration Project in 10 states. Nearly 30 years later, we have come so far. Gus put into action countless innovative ideas across the country and around the world with his work at the Foreign Agricultural Service and as Undersecretary of Farm and Foreign Agricultural Service, and more recently through his leadership and endless resourcefulness at Wholesome Wave. His passing reminds us of the need to continue the fight for the hungry, for our farmers, and for the constant work of more fully realizing America’s potential as both a great—and a good—nation. Gus never gave up. He had an uncanny ability to make connections between issues and people in ways few can. Everything in the policy world was simply a puzzle to figure out and he was a bureaucratic Rubik’s Cube master. He expected the best from us. Sometimes I kidded him that he had a new idea every minute and he needed to do more triage, but the truth is that I had a hard time keeping up. He was a mentor to me and countless others, patiently showing us the path forward and likely snapping our photograph along the way. As a fourth-generation farmer, Gus Schumacher knew the value of hard work and he dedicated his career to lifting up the voices of the least among us. Gus was a powerful champion for farmers. He also became a leading voice in the farm-to-table movement, encouraging restaurants and retail stores to buy produce locally to help support local family farms. Above all else, Gus made it his life’s mission to make it easier for families in need to access fresh, locally grown fruits and vegetables that help their kids grow up healthy and strong. Gus was always quick with a helping hand and encouraging word and never stopped fighting for what he believed in. His legacy of lifting up families in need will inspire us for generations to come. Gus was a good friend of mine and will be missed by many. Gus [will be greatly missed for] his knack to interpret government thinking and match it with the dreams and desires of communities. The consummate bridge-builder between the two, Gus was also a student of government. I recall attending one high-level meeting with Gus, thinking I had experienced two hours of platitudes and banality. By contrast, Gus was elated: “Did you hear the director’s word choices? This means we’re making inroads,” he said. Gus knew how to interpret and encourage forward motion inside giant institutions. I will miss his friendship and his patience and perseverance to move large and largely unresponsive institutions forward. He has inspired a generation of new Guses committed to public service and belief in the public good. I will dearly miss Gus, who was a good friend and a trusted partner. He was one of the first to connect local farmers to local chefs in New England, which has fundamentally changed our restaurants. But he also made sure that fresh, local food was available to all. As co-founder of Wholesome Wave, he was an effective advocate for giving low-income families more buying power to purchase fresh food. And you don’t have to look very far at USDA to see the profound impact he had on federal farm and nutrition programs as an undersecretary. His legacy will live on, showing just how dedicated, creative, and successful Gus was in championing a better food system. I met and began working with Gus 25 years ago, and I’m embarrassed to admit that at first, I didn’t understand what Gus did and how he worked. He was a policy wonk, but a very humble and respectful listener and brainstormer, and relentlessly positive and optimistic. What I most admired about Gus was his unique humanity. The main reason Gus was so effective and influential in so many places was his genuine love for people, and particularly those without access to traditional power and (importantly) funding. He channeled resources to small farmers, farmers of color, farmworkers, and refugees in particular. He made a difference in the lives of uncounted thousands, and I count myself among these. It was an honor to know Gus. He was full of ideas to the end and left much work uncompleted. I’m deeply saddened by his untimely departure, and resolutely committed to honoring him by pursuing and completing the things to which he was committed. Many thanks to the Wholesome Wave team and others for their collaboration on this tribute. A celebration of the life of Gus Schumacher will be held on Saturday, December 2, 2017 at 1:00 pm at National Presbyterian Church, 4101 Nebraska Ave NW, Washington, D.C. The event will include a memorial service with several highlighted speakers, followed by a reception. In lieu of flowers, the Schumacher family requests that donations be made to the work that Gus loved, so that they have the resources to continue. To achieve that goal, donations may be made to the Community Kitchen at Cape Cod Village in Orleans, Mass., and the Farmers Market Coalition of Kimberton, Penn. I met with Gus on many occasions to discuss his working ways of helping those in need to increase their buying power for fresh fruit and vegetable offerings. His passion was evident in everything he touched and it inspired countless individuals and organizations to become part of his network of doers. Not that long ago I saw Gus and he presented me with some pictures of the Plenge ,Bender and Schumacher farms in NJ .in addition to other representations of his time spent as a farmer in the Garden state. Gus was a champion who never forgot his roots in an industry he loved. I meet Gus when he used to come to Mexico many years ago. We've kept in contact on and off since then. He will be missed.